Emil Georgiev, the brother of Bulgaria's former road agency chief Veselin Georgiev, has been found guilty of covering up conflict of interests in public procurement deals. The scandal around the Georgiev Brothers blew wide open in January-February 2008 when it was revealed that between October 2006 and November 2007 Emil Georgiev's construction company "Binder" won tenders from the road agency (then called "Republican Road Infrastructure Fund") run by his bother. It led to much criticism of Bulgaria by the European Commission and preceded the freezing of several hundred million euro in EU pre-accession aid in the summer of 2008. The scandal with the road agency (which was re-organized and restructured subsequently) specifically moved the EC to block the funds destined for Bulgaria under the ISPA program. On Friday, the Sliven Regional Court ruled that Emil Georgiev had hidden the fact that he was related to the former road agency head. In his declaration under the Public Procurement Act, the younger Georgiev did not mention the fact that Veselin, the official responsible of assigning the state- and EU-funded projects, was his brother. While it has not become clear how much the Georgiev family profited from the conflict of interest scheme they were involved in, the sanction imposed by the Sliven court under Bulgarian law on the younger brother appears to be ridiculously small: he was sentenced to a BGN 2 500 fine. Emil Georgiev was a member of the Board of Directors of Binder; the CEO of the company Dinko Penev and the other member of the board Zheko Zhelyazkov, also received the same sentences. The ruling can be appealed within two weeks. The trial against Veselin Georgiev, who became publicly known as "Batko" (the Bulgarian word for older brother) is scheduled for the end of September at the Sofia District Court. 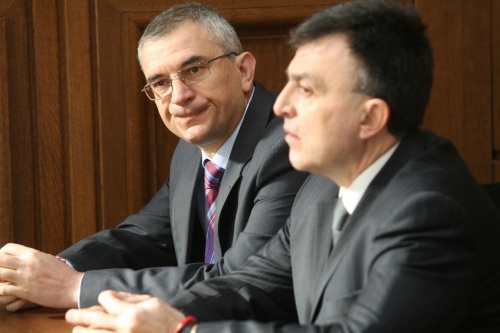 Veselin Georgiev is charged with abuse of power and criminal breach of trust that benefited the companies employing his two brothers – Binder (Emil Georgiev) and INMAT (Boyko Georgiev) when assigning road rehabilitation projects.